Many people know older homes might contain asbestos, especially in ceiling materials and floor tiles. There’s often little doubt as to whether decades-old insulation or fireproofing has asbestos. But what many people do not realize is asbestos could be hiding in seemingly safe everyday items. There’s nothing more terrifying than knowing asbestos may be lurking in the hands of your children or loved ones. Their health and wellness could be put in danger when a simple family outing could potentially introduce them to different mesothelioma risk factors. Mesothelioma is a deadly asbestos-related cancer that usually forms on the thin tissues that protect the lungs and abdomen. The World Health Organization estimates 107,000 workers around the world will die every year of an asbestos-related disease, equaling 300 deaths per day. As Global and National Asbestos Awareness Week ends today, it’s crucial that we take the first steps to limiting the risk through education and increased awareness. Wait, Asbestos Isn’t Illegal in the US? Asbestos is not banned in the U.S., but it almost was once. In 1989, the EPA issued a final regulation banning most uses of asbestos. Through this, an end was in sight for the importation, processing, manufacture and distribution of products containing asbestos. Unfortunately, the asbestos industry’s aggressive counterattack claiming the ban would cause job losses and economic consequences led to the overturning of the ban. As a result, asbestos is still imported into the country. While an increased number of regulations have limited asbestos production in the U.S., we are not in the clear. But homes, schools and workplaces are not the only at-risk exposure sites. There may be asbestos closer than you think. Asbestos hides in more places than you’d guess. Used for its high heat resistance, strength and insulating properties, asbestos was often added to various products despite its toxic nature. The only fears many people have when visiting the local bowling alley are dropping an eight-pound ball on their foot or slipping down the lane, but the real risk may be in the balls themselves. 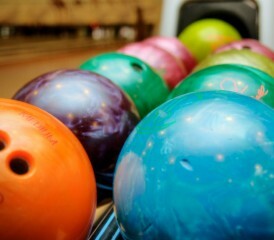 Historically, bowling balls were made of asbestos and fiberglass. Pro shop owners would inhale the deadly asbestos fibers when drilling holes into the equipment, raising their chances of developing mesothelioma. When the new bowling balls were placed on the racks for everyone’s use, there was no guarantee asbestos fibers wouldn’t be released into the bowling alley’s atmosphere or the user’s fingers. Bowling balls can last for decades. And while most modern bowling balls are not made with asbestos, that perfect nine-pound, magenta bowling ball you chose at the bowling alley may actually be an older, asbestos-filled one. Talc is a household substance around the world. The soft mineral is widely used today in many products, including pharmaceuticals, cosmetics, chalk and ceramics. Unfortunately, the seemingly harmless substance is raising red flags because of a dangerous risk of asbestos exposure. The connection between talc and asbestos involves the close proximity of the two minerals on the earth’s surface, which often results in contamination. Although researchers have debated the connection between talc and cancer, new lawsuits are reinforcing the validity that talcum powder may lead to mesothelioma, lung and ovarian cancers. Recently, deadly asbestos was discovered in crayons and other children’s toys. Through independent tests, asbestos fibers were found in four of the 28 boxes of crayons tested, and two of the 21 crime-scene fingerprint kits. This is the third time in the last 15 years asbestos fibers were uncovered in licensed children’s products. As a result of this potentially hazardous find and at the plea of lawmakers, several major retailers – Toys ‘R’ Us, Party City, Amazon.com and Dollar Tree — pulled contaminated children’s products in order to put safety first. That incident serves as a grim reminder that children may be exposed to a toxic substance in a place parents least expect it: Their own toys. Nobody wants to think their beloved novel may be bound with asbestos, yet major controversy ensued when the New York Times ran a blog about two science fiction first editions being bound in a silvery, asbestos material. Surprisingly, “Fahrenheit 451” has a notorious past for being bound with asbestos in hopes the book would never be burned. It isn’t the first time book bindings contained asbestos. In fact, reports show bookbinders were exposed to asbestos in the mid-1900s. Now, we must wonder whether early book editions created and bound in the mid-1900s are actually wrapped in an asbestos-filled binding. Crayons are not the only children’s toy known for dangerous asbestos contamination. Recent reports found asbestos in modeling clay. ArtSkills Clay Bucket and Ja-Ru Toy Clay contained traces of asbestos, according to Environmental Working Group tests. Undisturbed asbestos typically does not carry the same dangers as airborne asbestos, but a problem arises when children put toys, such as clay or crayons, in their mouth. Ingesting asbestos can greatly increase the risk of developing peritoneal mesothelioma, which occurs in the lining of the abdomen. Because of the long latency period of mesothelioma, children exposed to asbestos from modeling clay may not see mesothelioma symptoms for 20 to 50 years. Not every single product in these groups contains asbestos. In many cases, it is older items produced before the dangers of asbestos were understood. But now that we know the high risks associated with asbestos exposure, we must come together to urge for a ban on asbestos. Without a ban, it is still legal to use small amounts of asbestos in common household goods. However, no amount of asbestos exposure is safe. We all deserve better.